Swiss NGO Public Eye sends polluted air back to Switzerland. Freundliche Gruesse creates multichannel campaign “Return to Sender”. Based in Switzerland, big oil traders like Trafigura blend cheap fuel with sulfur levels hundred times over European limits. They sell the “dirty diesel” in African countries where the weakness of local fuel standards can be exploited. 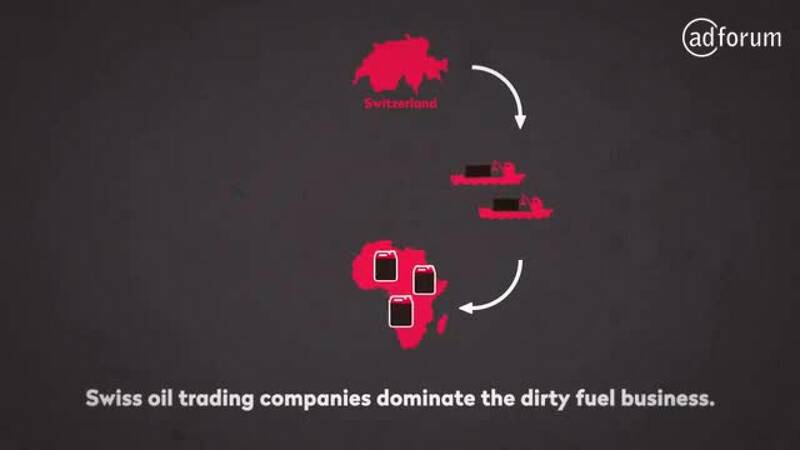 The Swiss NGO Public Eye published a 160-page report about the dirty business. In order to expose this practice and to push Trafigura to change it, the NGO had to act and to present the findings to a larger public. Return to Sender: We sent the dirty air back to the responsible company. To show the shocking health impacts dirty diesel has on the African population, Public Eye asked us to do a unique campaign. With the help of activists in Accra, Ghana, we shot a short film showing local people capturing the polluted air into canisters and return it to the sender. As a reaction to the dirty business of Trafigura: We sent the air in a shipping container back to the commodities giant. With the campaign, we wanted to create public pressure through the mass media and then through the people, in order to get the involved companies to change their behavior. A multichannel campaign with a petition to stop Trafigura. The campaign was implement in 3 phases: In phase one, the audience was shown a teaser film with local people capturing the polluted air into canisters and return it to the sender. In phase 2, the journey of the dirty air to Switzerland started and was a public event. Users could follow the cargo ship in real time on the website returntosender.ch, including precise geolocation of the container ship, weather data and progression. It led to a petition demanding Trafigura to stop their dirty business and focus on their goal of becoming market leader in social responsibility. The hook of Phase 3 was the delivery of the dirty air to the sender. Ghana toughens its sulfur standards in March 2017. The petition was signed by almost 20´000 people. Accompanied by the press, the signed canisters and the petition were handed over to Trafigura at their headquarters in Geneva. Public pressure caused by our campaign moved the government of Ghana to toughen its national sulfur standard by a factor of 60 in March 2017. Other West African countries will follow.